Bread pudding doesn’t have to be sweet, you know – and when it’s not, I think it sounds better as a strata (fancy name, basically the same thing). Pudding’s not such a great word to begin with, but “savory pudding”…no thanks. 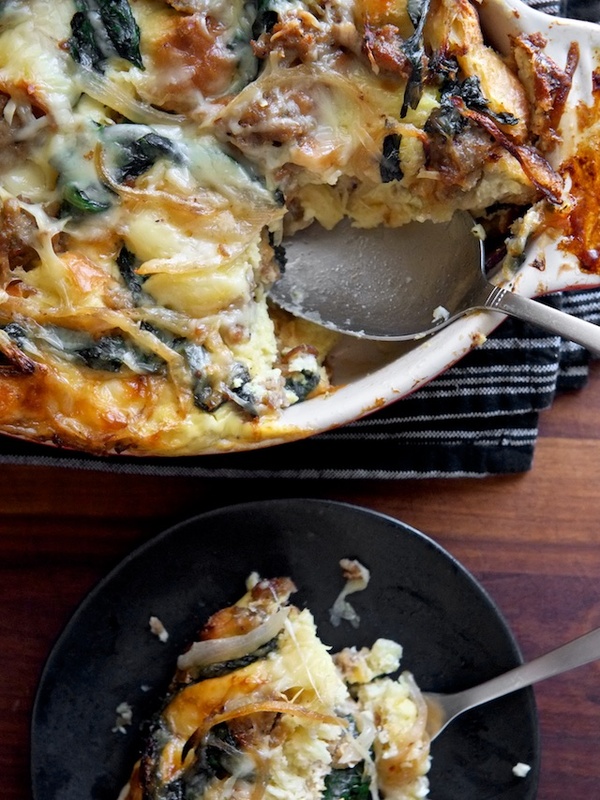 Breakfast strata? Don’t mind if I do. 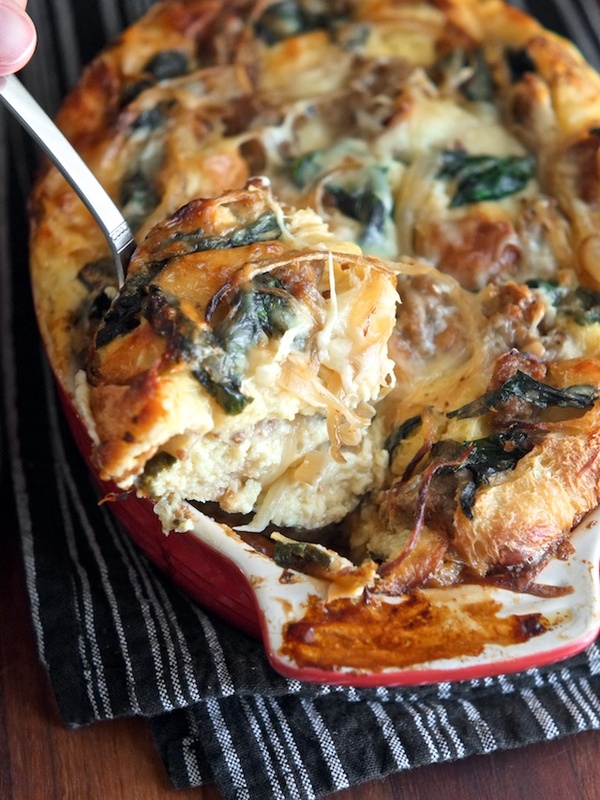 We’ve covered all the basics of bread pudding construction in my last post, so all you really need to know for this one is: challah bread, hot breakfast sausage, spinach, onions, gruyere cheese, salt, and a pinch of nutmeg. 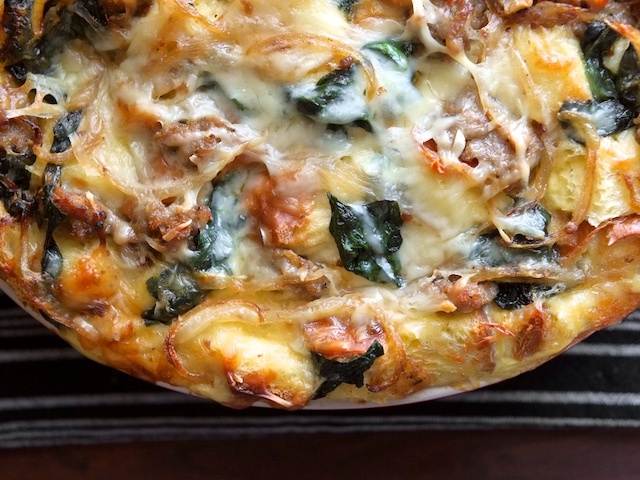 It’s my favorite breakfast casserole that I’ve ever tried, and actually kind of handsome, for a pudding. 1. In a skillet set over medium heat, brown the sausage while breaking it up with a wooden spoon and set it aside. 2. In the same skillet that you used for the sausage, cook the onions in the left over fat until they are slightly browned. Season the onions with a pinch of salt and a splash of vinegar (cooked onions always taste a little better with a small splash of vinegar). 3. If you are using fresh spinach, add it to the pan with your onions to wilt, if you are using frozen spinach you can defrost it in the pan with the onions. Cook the spinach and onions until they are no longer releasing water, the onions are browned around the edges, and the spinach is soft and wilty. Season veggies to taste with salt. 4. Grate your gruyere cheese and cube your challah. 5. Butter your casserole dish and create a solid layer of challah in the bottom of the dish – really squeeze in a piece of bread wherever you can so the bottom is completely covered. Then add about 1/3 of your cheese, 2/3 of the sausage, and 2/3 of the spinach and onions, followed by another 1/3 of the cheese. Cover the sausage and veggies (more loosely this time) with the rest of the bread cubes. Top with the last of your sausage and vegetables. 6. Whip up your custard with one egg per cup and a half of bread (eyeball it – it’s easy to make a little more if you need to) and 1/2 cup of half and half per egg. (My small dish, filled to overflowing with bread, used about 4 eggs and 2 cups of half and half). Season the custard with 1/4 teaspoon of salt per egg, and a pinch of nutmeg. 7. Pour the custard over the assembled casserole, being sure to saturate all of the dry bread cubes that are sitting on the top. Use as much custard as is needed to saturate the bread and leave a liquid line about 1/2 way up the side of your casserole dish. 8. Top your casserole with the last of your cheese, cover with plastic wrap, and let it rest for at least 2 hours and up to overnight. 9. When it’s ready to bake, turn your oven to 325F. Remove the plastic wrap from the casserole and replace it with aluminum foil. Bake the casserole for at least 45 minutes covered, then uncover and bake for at least 15 minutes more, or until a knife inserted near the center of the casserole comes out clean. If you want a very brown and crispy top to your casserole, turn on the broiler for a minute or two (but keep an eye on it because cheese burns quickly). Allow the casserole to cool for about 10 minutes before serving. This was delicious! I was nervous about it because I've never made one of these before and I picked Easter Sunday, of course, to give it a try. I used 8 eggs and 4 cups of cream for my 13" x 9" pan, and baked it for 2 hours. Probably would have been done at 1.5 hours, but I wanted to make sure it was done. Everyone raved. Thanks for a great recipe! Judy I'm so glad the recipe worked for you! I tend to worry that my "adjustable" recipes are too different for people to comfortably use, but they're just more practical IMO. Did you use cream instead of half and half? I might have to try that myself - it sounds decadent in the best way. Thanks for returning and reporting!